Before your van foreman completes loading, give him/her a phone number where you can be reached once you leave. It is VERY IMPORTANT to provide an alternative contact number in case you cannot be reached in your new home. When it comes to moving, one of the most difficult items to pack is your glassware. Unlike all your other belongings, glassware needs to be handled with extra care throughout the move to ensure it arrives in your new home in the same condition it left your old home. As the premier movers in Kamloops, here are some tips to help you safely move your glassware so it arrives unbroken. The most important step when it comes to packing your glassware is using the right type of packing material. Glass is fragile and will chip or shatter if it comes in contact with other items in a box. Make sure to individually wrap each item so that it is protected throughout the move. Paper – Newspaper or other readily available paper is a cheap and easy way to insulate glasses or dishes from each other once they are packed. The one drawback of newspaper is that it can leave ink stains or marks on your dishes. Bubble wrap – Bubble wrap can make either a great beginning or secondary insulation for your breakables. Always make sure to purchase more bubble wrap than you think you need as it is an excellent material for other home items too. Not damaged in any way – all corners are intact and not bent, none of the flaps have been ripped and the sidewalls have not been creased. A heavier or thicker cardboard than your standard cardboard box. If needed, we have special boxes available to help you store your glassware safely. Make sure that each cardboard box is packed full of paper to take up all extra space to prevent shifting. Do not jam pack your boxes and make sure that they are light enough that the movers can easily carry them without dropping them. Proper packing tape is also an important factor when it comes to protecting your glassware. The last thing you want is for the bottom of your box to open and your glassware to spill and break all over the floor. Ensure that your boxes are properly labeled and marked. 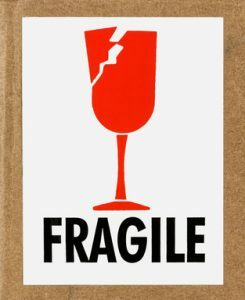 Make sure to include the word fragile and it is recommended that you label each box’s content. This will not only allow the movers to properly stack your boxes, it will also make your job of unpacking that much easier. It is a good idea to label all your boxes, not just the fragile ones. Take the extra time to wrap and protect your dishes and glasses and you should enjoy a break-free move. If you would like to see other packing tips please see our Packing Tips page or stop by today. We would love to be a positive part of your moving experience.